" Ramayana - The Game of Life : Stolen Hope " - An enthralling Read ! 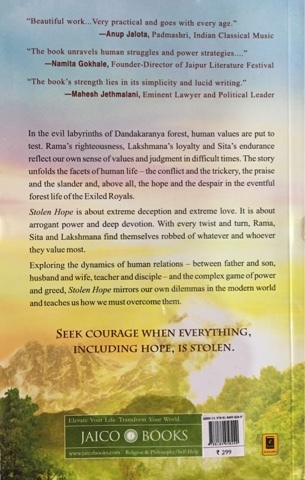 This book has been titled ''Ramayana - The Game of Life :Stolen Hope '.It has been authored by Shubha Vilas who other than being a qualified engineer and and a lawyer with specialization in patent law is also a spiritual seeker and a much sought after motivational speaker at institutes and universities across the world . Thi is the third part of the Ramayana series by the same author . The first part of this successful series " The Rise of the Sun Prince " narrates the story of Ayodhya and King Dasratha before the birth of Lord Rama going on to describe the tale of the birth of Lord Rama and ends at his subsequent marriage to Sita . The second part of this Ramayana series ," Ramayana - The Game of Life : The Shattered Dreams " starts twelve years after the marriage of Lord Rama and Devi Sita .It starts with the plight and nightmares of King Dasaratha agonizing over the future of his Kingdom Ayodhya .The shattered dreams refers to his dashed hopes of seeing Rama coronated as the illustrious crown Prince of Ayodhya . The third part in the series "Ramayana -The Game of Life : Stolen Hope " starts from the time the trio of Lord Rama , Lakshmana and Sita set foot in the forests of Dandakaranya after being banished to the forests for forteen years as demanded by Queen Kaikeyi .It goes on to narrate their ordeals and the experiences when coming across sages and demons and various creatures of the jungle . 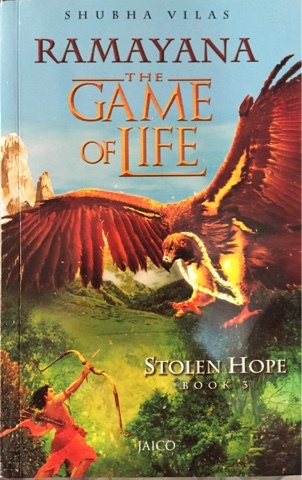 ''Stolen hope '' in the title refers to the hopelessness of Rama after the abduction of Sita by Demon King Ravana .The book ends with the death of Jatayu and the meeting of Wonder-monkey Hanuman with the two Sun princes Rama and Lakshmana . Even though I had read the Ramayana in full detail earlier too , I find that the narration is true to the original Valmiki Ramayana and also it is able to hold my attention because of the great details provided .In fact I almost felt like I was going through a science fiction novel ... ! Though I found the second part a bit tedious and monotonous while dwelving into the grief of King Dasratha on seeing his beloved son Rama being banished into exile , I was quite enthralled by this third part of the " Ramayana -The game of life -Stolen hope ". The footnotes given at the bottom of every page not only add value and neat explanations to the story telling but also give us a modern interpretation of the various events .The author also gives some beautiful lessons in dealing with human relations and life management .
" Historical travel creates roadmaps . Historical speeches create mindsets . Historical habits create cultures . Historical mistakes create wisdom ." "Real faith is not about having insane ,intense belief for a short duration but about having progrssively increasing conviction for a longer duration ." Final verdict - The "Ramayana -Book 3 The Game of Life -Stolen Hope " is not just a very interesting retelling of the Ramayana which will appeal to all age groups but at the same time it also succeeds in imparting some beautiful life lessons to learn from this Epic as retold by Shubha Vilas . In fact I am now eagerly awaiting the release of fourth part of the series . I used to be a voracious reader earlier but now I hardly even get the oppurtunity to gobble up all my fashion mags :D After reading your review, I would definitely love to read this! True we are busy, but books are a weakness still with me ! This book is a wonderful and engrossing read . Good that you still love books, I left their association in college itself...also I hardly get time! Thank you Alok ji for stopping by !